Analysis of storage asset economics shows that in a weak seasonal price spread environment, cushion gas value may drive owners to close or sell assets. Seasonal storage operators across Europe are confronting a harsh reality. Many slower cycling seasonal storage facilities are not economically viable at current seasonal price spread levels. The seasonal price spread at the key Dutch TTF hub has fallen from levels above 10 €/MWh a decade ago to below 2 €/MWh over the last 5 years. This has left storage operators struggling to cover fixed costs, let alone to earn any return on capital. 2016 saw some recovery in spot price volatility, the other key market price signal for gas storage assets. A recovery in spot volatility is good news for faster cycling storage assets designed to respond to shorter term price fluctuations. But seasonal price spreads remain in the doldrums, suggesting a continuing surplus of seasonal supply flexibility, despite the loss of Rough flexibility and reductions in Groningen production. This can be seen in Chart 1 showing the evolution of the front year TTF seasonal price spread. Ongoing weakness in seasonal spreads has caused operators, including Uniper, RWE, OMV & Engie, to suffer impairment charges relating to seasonal storage assets. Many European operators are now in the process of strategic reviews to decide on the future of storage assets. We consider the strategic options that they face in today’s article. The level of seasonal price spreads is only one of a number of factors driving storage asset economics. The level of fixed and variable cycling costs are a key determinant of asset returns and competitiveness versus other facilities . Long term contract positions can insulate owners from the pain of lower price spreads, but can on the other hand result in long term obligations to service customers. Ability to access cushion gas value is also a key consideration. We summarise the main strategic options confronting owners of seasonal storage assets in Table 1. Stem negative cashflow & losses. Many owners (and their shareholders) are losing patience with Option 1. This in our view is going to precipitate a growing shift towards Options 2, 3 and 4. Transmission charges, which vary from country to country, form a significant portion of fixed opex of gas storage assets. Moves to harmonise gas transmission charging methodologies and potential discounts for storage assets may help reduce fixed costs faced by storage operators. It is useful to look at some high level numbers on seasonal storage asset economics to appreciate the challenges facing owners. In order to do this we focus on the key option to remain open (1) or to close and withdraw cushion gas (2). The other options to mothball or sell (3 or 4) are variations on these. Scenario 1 illustrates how the economics of a generic seasonal storage asset are marginal at current spread levels (NPV of only 5 € per MWh of working volume). Less advantaged assets may actually be NPV negative, assuming no market recovery. 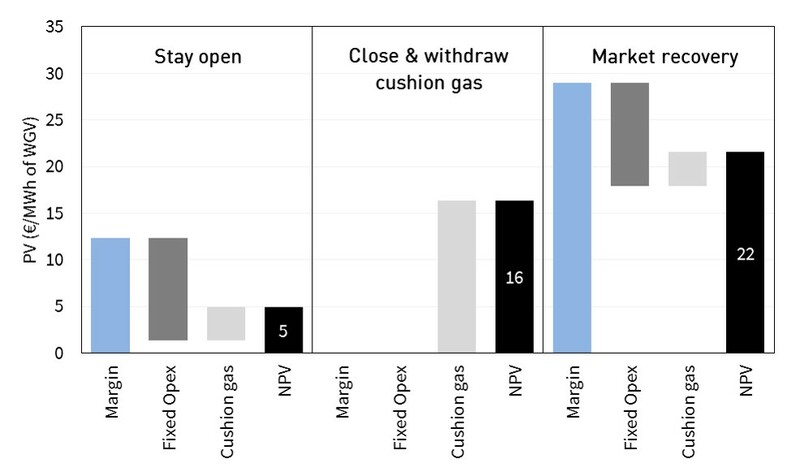 Scenario 2 (NPV of 16 € per MWh of working volume) illustrates the incremental value of closing and monetising cushion gas value vs Scenario 1. Scenario 3 (NPV of only 22 € per MWh of working volume) illustrates the potential value upside from a recovery in seasonal spreads, back to a long run average of 3.00 €/MWh by 2020. This recovery upside represents a relative small incremental gain compared to closing and selling cushion gas, bar any regulatory relief via fixed transmission cost reductions. It is this dynamic that is likely in our view to lead to a number of seasonal storage assets closing over the next year or two. Aside from closing or waiting, the other option open to storage facility owners is to sell assets, an option that is currently on the table for a number of operators. Sale could either be to an investor with a more optimistic view on market recovery or with a more aggressive risk appetite. 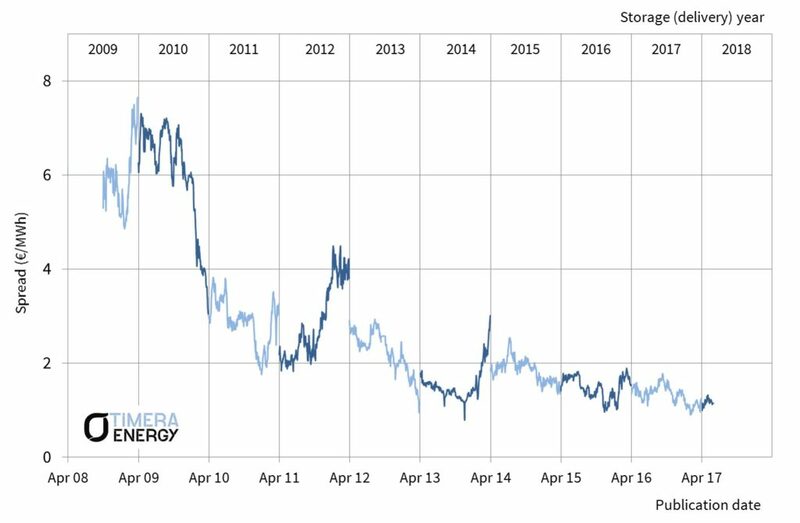 Selling a storage asset has the attraction of allowing owner fast access to cushion gas value, without having to incur market risk across the gas withdrawal period. But asset price is clearly key to determining whether there is value for prospective buyers. The aborted sale of the RWE DEA German storage assets in 2016 illustrates the challenges of selling storage facilities in the current market environment. Flexibility & cycling speed: The European gas market has a greater need for the short term deliverability provided by faster cycle storage, than for seasonal flex (which can be provided by e.g. Norway, LNG imports). Asset cost structure: Low variable costs mean storage is more competitive in providing flexibility. Low fixed costs reduce required revenues to hit return targets. Location: Some markets/locations have strategic/insurance premiums or regulatory volume mandates associated with storage capacity that support asset value. Contracts: Legacy long term contracts signed at higher price levels can help protect asset margin while buyers wait for market recovery. There is a genuine interest in gas storage as an asset class from more adventurous infrastructure investors. But this has not been well tested in recent years due to a limited number of storage asset transactions. Whether via direct closure of sale and consolidation, Europe is likely to lose a significant volume of slower cycling storage capacity over the remainder of this decade. Decisions to close less flexible and higher cost seasonal assets should help underpin the recovery in the value of faster cycling assets with a lower variable and fixed cost base. The closure of seasonal storage assets may also help to accelerate the recovery in hub price volatility. In an environment where there is a weak seasonal spread price signal, slower cycling storage assets focus more on responding to short term price fluctuations. So closure of seasonal storage capacity reduces the volume of working gas volume competing to dampen spot price volatility. That is good news for faster cycle storage assets.